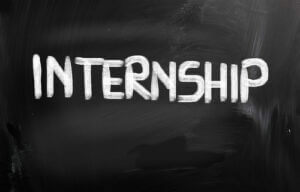 Internship concept in black background. Photo courtesy of Shutterstock. The summer is upon us, and if you haven’t yet landed a seasonal position or made plans for the months ahead, the pressure is officially on. Here are a few ways to land a great opportunity that will send you back to school in the fall (or into the professional job marketplace) with a set of new skills and some valuable experience under your belt. 1. Apply for lots of them. Keep an open mind. One summer is by no means a lifetime commitment, and at this point, the industry you choose doesn’t matter quite as much as you may think. What you really need is some experience with the deadlines, early mornings, teamwork, planning, and organizational skills that accompany just about any job in any professional field. So if you haven’t added business, healthcare, marketing, law, development, sales, distribution, or creative positions to your list, you’re leaving stones unturned. Apply everywhere, and don’t reject any broad category out of hand. Most important: don’t wait to hear back from each position before you submit an application for the next one. At this stage of your career, nobody expects you to step in the door as a seasoned professional. But ironically, they do expect you to ACT like one. You may not know how to write a grant, or conduct a marketing study, or win over a client, or negotiate a contract with a vendor. But you know how to hold up your end of a conversation. And you do know how to present yourself as trustworthy, neat, intelligent, and reliable. When it comes to winning at the game of career bingo, these are the free spaces in the center of the square. So get them right. Practice your eye contact and your firm handshake before your first interview. Ninety percent of the presentation skills described above start with one word: confidence. Keep your back straight and speak with conviction and clarity. Don’t mumble. Say yes and no with clear, sharp tones, and don’t let your sentences and statements trail off at the end. You deserve the positions you’re applying for. So stand behind your credentials, whatever they are, and expect success wherever you go. You deserve the positions you’re pursuing, but you don’t need them. Know the difference and you’ll be better able to protect yourself from sketchy “employers” who are just looking for young, inexperienced workers they can exploit for free or below-cost labor. Desperation makes us vulnerable. So before you say yes to any opportunity, make sure the company and the position are legitimate. And remember that you can always change your mind and walk away if you find out later that you made the wrong assumption. 5. If you’re pursuing unpaid opportunities, choose non-profits. If you have to choose between a for-profit corporation and a non-profit organization like the Red Cross or the Humane Society, opt for the second. Your experience will be more valuable, since you’ll probably be taking on higher levels of real responsibility, and you’ll also be less likely to waste time and expose yourself to exploitation. If you’re being paid in experience, not money, choose a group that can put those financial savings to good use—don’t work for a hedge fund or belt-buckle manufacturer that could easily afford to pay you but simply chooses not to. LiveCareer (www.livecareer.com), home to America’s #1 Resume Builder, connects job seekers of all experience levels and career categories to all the tools, resources and insider tips needed to win the job. Find LiveCareer on Youtube and visit LiveCareer’s Google+ page for even more tips and advice on all things career and resume-related.